Today is a special day at BBS. 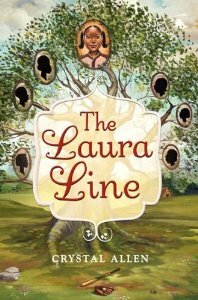 Team member Crystal Allen’s latest novel, The Laura Line (Balzer & Bray) made its debut. We’re so proud of Crystal and excited about her new book. Don’t you just love the cover? Check out the awesome book trailer here . To learn more about The Laura Line and Crystal’s work, please visit her site www.crystalallenbooks.com. Love your BBS Family :). The trailer is wonderful and I’ll be reading The Laura Line as soon as I get my copy! Yaaay! Happy book birthday, Crystal!!! Thanks, Gwendolyn, tadmack and Tee! I had a great day and The Brown Bookshelf love was icing!